View of female workers in County Down, Ireland. This is the sixth plate in a series of twelve views of the linen manufacturing process, produced by W. Hincks. Spinning the yarn was always done by females, working in small workshops in their own cottages. 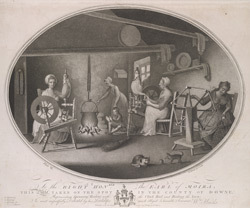 The Irish spinning wheel, seen here on the left of the print, was introduced in the early 18th century from Holland, the wheel was kept in motion by a foot operated treadle and the spun yarn was wound around a bobbin. These bobbins were then passed to another worker, seen here on the right of the print, for winding on a clock wheel or click. This process provided the standard measurement for yarn- a cut, or 120 revolutions of the wheel. Once the yard had been measured it was boiled and then dried.